This rose was found by Carl Cato. It is a semi double with a soft pink center. Bloom size averages 2-3". A Kordes rose from 1956 this variety may be grown as a shrub, pillar or climber. It is generous with large quartered blooms that have a tea fragrance. This China rose from 1904 was bred by Albert Nabonnand in France. It has a glossy dark green foliage to act as a back drop to the crimson blooms. The prolific blooming will be greatly appreciated by any gardener. From 1949 this rose is a variety that produces large blooms, up to 5 inches. The blooms are very full. Although a climber she may be grown as a shrub or pillar. A 1976 introduction in America, also an All America Rose Selection that year. Height will vary greatly by location. Classed as a climber, here in Florida it grows 3-4' It is self supporting and should be considered for all gardens. From 1858 this is a plant that blooms with flowers frequently exceeding 3". The bloom is dark pink and lightens as it ages, being very full. Bearing a mild fruity scent the large blooms come out as a pink in cooler weather. The blush color seen as they fade is accompanied by an almost cherry colored edge. This makes a fine shrub rose. Bred in France in 1858 the large, highly scented blooms will add interest to any garden. A 1985 introduction bred by David C. H. Austin, known for large fragrant blooms. A David Austin introduction from the UK in 1983, this is the registration name for this shrub with very upright growth, ideal for a narrower area. Bred in France from 1924 the mauve blooms are sure to attract attention. Compact in growth with a grape fragrance. Ballerina is a 1937 introduction from the UK. Putting forth clusters of flowers with a mild musk fragrance this makes a good choice for a shrub rose. Shade tolerant. A found rose, disease free here in Central Florida . Branches nicely in a self supporting fashion. Blooming in clusters. Generally prickle free. Bright shiny leaves. From 1841, with a strong damask fragrance one will truly appreciate the large flat blooms (5-6") on this variety. A favorite Hybrid perpetual of many, very hardy. From the United Kingdom, this 1936 introduction can be grown as a shrub, pillar or multiple plants can be grown as a hedge. Blooming in clumps of flowers this will catch everyone's eye. This is an Earth Kind™ rose from 1988. 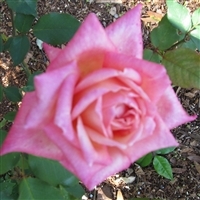 Belinda's Dream has a pleasant raspberry fragrance with frequent flushes. The 3-4" blooms put on an pleasing display, decorating the plant with many very full blooms. This is a sport of Mutabilis found in the Bermuda garden of, and by Ronica Watlington. Buds predominately open yellow with some opening pink. A found rose single petaled from Bermuda. This grows as a shrub and has a mild fragrance. Bred in 1926 this variety grows in a shrub form. It has a fruity fragrance from the semi-double blooms. The blooms have a pleasant coverage over the plant. The buds lighten upon opening to an apricot color.